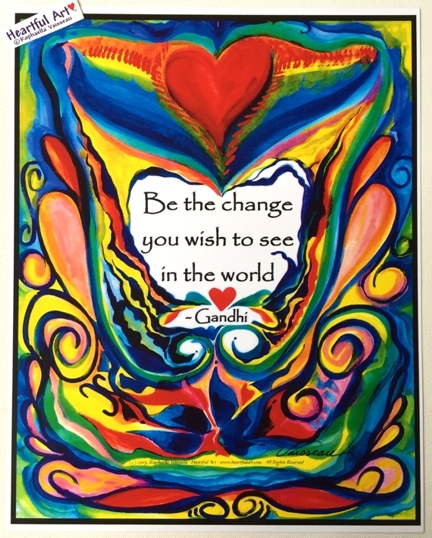 Colorful rendition of Gandhi's famous words as an 11x14 poster with art by Raphaella Vaisseau. More than a call to action, Gandhi�s quote, �Be the change you wish to see in the world,� is a reminder to tend our own gardens and walk our talk. Many spiritual teachers have said that when the finger of blame is pointed at someone else, there are three other fingers pointing back at us. Thus, it's also a reminder to refrain from judging others. This quotation is an inspiring way to call on ourselves to make a difference first in our own lives, in our own relationships, in our own ways of being. Who we are being will ripple out to have an effect on our friends, family, workplace, city where we live, country and the world. We can go from there to change the world, having first cleaned up our own act. Remembering this point of view takes the macro down to the micro so we can see it more clearly. Then we can take action accordingly. This is a motivational gift to inspire us all to make a difference in the world by making a difference first in our own lives. It's a keepsake for yourself and for anyone you know who is (or wants to be) changing the world for the better. Walk your talk. Tend your own garden. Be the change.